From the way some—okay, all—publications are covering LA’s mobile dining scene lately, you probably think we’re spending three hours per night waiting in line for tacos served with kimchi and an oDD prediLection for speLLing woRds with randoM capitaLiZed LetteRs. Not so, my fine foodie friends. 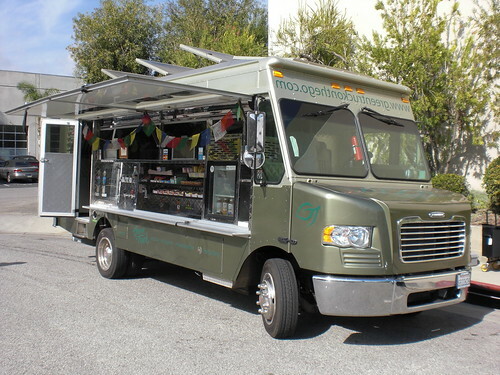 Way before Kogi had a Twitter account, there was a groundbreaking mobile eatery providing not only sustenance, but education, as a type of organic intervention center-on-wheels. After spotting it all over town, I finally caught up with the frying oil-powered Green Truck for ReadyMade. 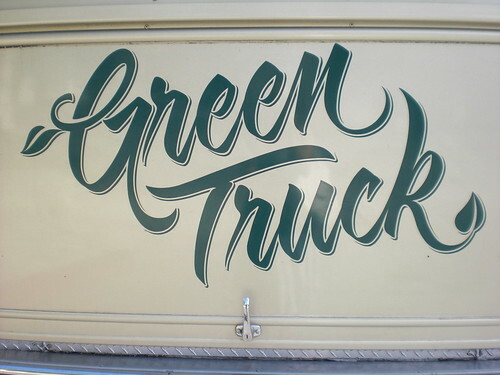 On a sunny weekday in Culver City I located Green Truck founders Mitchell Collier and Kam Miceli, just a few blocks from their solar-powered headquarters. I thought my timing was so good because I was straddling the transition between breakfast burrito and lunchtime burger (yes, I had both), but I also lucked out because they just happened to be doing the photoshoot for the article with David Hennessy. Who knew how many actual burgers it took to get that one perfect burger shot? Three. Regardless of how they looked they all tasted perfect to me. Mitchell and Kam call themselves “all-food-itarians” and they love a good Niman Ranch burger just as much as their tofu burrito, a perspective I found overwhelmingly refreshing. Truck service covers a range of sandwiches, tacos and wraps but they can make just about anything you’d like if you hire them to cater your next event, which they’ve been doing a lot for photoshoots and festivals. Mitchell also introduced me to my first kombucha, which was a pretty excellent refreshment as I snacked on the “reject” fries (a russet and sweet potato combo). Green Truck co-founder Kam (with the apron on, above) will be speaking at Dwell on Design at the end of June, alongside the folks from gourmet wienermobile Let’s Be Frank (which is parked weekly at Silverlake Wine). On the other side of the thermometer, I hear Locali will be peddling organic snowcones on their Icycle, but this summer I plan to be chasing Coolhaus, an ice cream sandwich truck dispensing design and dessert with flavors like Richard Meyer Lemon and Mintimalism. More great news that will have to tide me over until then: Remember a few months ago I was anxious about big changes at ReadyMade which I thought might signal the end of one of my favorite mags? Well. I recently got word that Andrew Wagner—former editor at Dwell and for the past two years editor at the revamped American Craft (which I reviewed in last year’s Print)—is now the new editor-in-chief at ReadyMade. Their blog recently relaunched and you can take a tour of their new digs in Des Moines as well as meet all the staffers who are making it happen. Now I can’t wait to see the changes in store for the re-made ReadyMade. This entry was posted in creating, eating, greening, growing, ReadyMade. Bookmark the permalink. Where can I find that truck? The Kogi tweets aren’t randomly capitalized – only, and always, the Ls. And the tacos are remarkably tasty. j gold, you’re absolutely right! Somehow I didn’t notice that small detail. Apparently some kind of typography thing. Actually, it’s funny, I have had mobile eateries on the brain lately and last night I had a dream about Kogi, but all I did in the dream is wait in line. Unfortunately, that’s not a dream. I’ve yet to actually make it to the front of the line.